Ford Mustang 5.0 V8 GT [Custom Pack 1] 2dr Auto 2019 Review | What Car? What Car? will save you at least £1,334, but our approved dealers could save you even more. 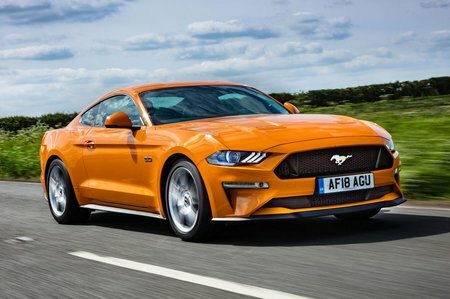 Aside from the massive V8 under the bonnet, GT models get different 19in wheels, a switchable exhaust system, a different grille and GT badging. It may be more expensive to buy and run, but it’s worth digging deep for this sumptuous slice of American pie. The 444bhp engine needs working hard to deliver the goods, but take it up to 7000rpm and you’ll be smitten. Also found under the bonnet of the limited-edition Bullitt variant, but with an even meatier 453bhp.